Dany Bahar: new champion of the bespoke car world? You probably know Dany Bahar best for Lotus, and all that went right and wrong in his three-year reign there as CEO. Or maybe as the man credited with taking Red Bull into Formula 1, NASCAR and football. Or perhaps even for his role heading up licensing and merchandising at Ferrari. 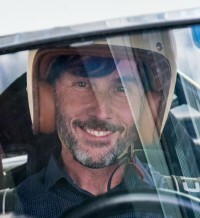 Now he’s back, to ‘reinvent the world of coachbuilding’ – with both modern and classic machinery – in his role as head of Modena-based company ARES Design. Bahar is all smiles and manic enthusiasm when we meet him at the ARES Design factory on the outskirts of the city. It’s a recently refurbished, 18,000-square-metre former Fiat dealership – now in de rigueur white with glass walls, its employees all dressed in black, mostly in suits with silver ARES Design lapel badges or in ARES Design logo’d polo shirts. From the outside, there are tantalising glimpses of cars new and old under construction: Porsches, Mercedes G-class es, a couple of intriguing Bentley coupés, and a few beefed-up Land Rover Defenders. There’s no sign at this stage of the De Tomaso Pantera evocation that broke cover late last year – one of the few times that ARES Design has made the news. Bahar is convinced he’s found a niche, a gap in the coachbuilding revival that so many of the manufacturers – Aston Martin, Bentley, McLaren and, of course, Ferrari – have already hit upon in the past few years, often collaborating with established coachbuilders such as Zagato and Touring. But where the manufacturers charge over a million, sometimes several million, for one-off versions of their current models, Bahar says that the most ARES will charge will be €700,000-800,000 – and usually less than half of that, sometimes a third, working on high-quality conversions of used and classic vehicles. The other big difference is the involvement the customer will have in designing the car. ‘This is about creating a new segment, a new niche in our business,’ proclaims Bahar. ‘Other companies have been doing it [coachbuilding] for over 100 years, but the approach we’re taking is different. We don’t claim to be car manufacturers, we don’t claim to be the best engineers, but we do claim to be the best project managers. What does that actually mean? It doesn’t become clear until the various projects are revealed, on an exploration of the factory. From producing high-quality carbonfibre bodykit conversions, ARES Design’s plans took a different turn when an English customer suggested an interesting conversion. He was a big fan of the Brooklands – the delicious two-door coupé version of the Azure built by Bentley from 2008 to 2011 – and was disappointed that the marque had discontinued the model. ‘What can you do?’ he asked ARES – and this is the equally delicious answer. The company has created a two-door coupé from the four-door Mulsanne saloon. The donor car is first 3D-scanned, and then the entire roof is removed from just behind the A-pillar back. New roof panels are made in extruded aluminium, with a central panel in carbonfibre. The B-pillars are moved backwards to accommodate new, longer doors (still with the required side-protection bars within), and new rear quarters are created to fill the gaps where the rear doors would have been. The resultant car is said to be 300kg lighter than standard; the engine is also tuned by ARES, to develop over 690bhp and 800lb ft of torque. The conversion takes around 12 weeks, and costs €715,000 including the cost of the donor car. Several have been built already; the car we try is near complete, just awaiting the final exterior trim work around the side windows. The quality appears excellent, and the car’s lines are exemplary – this is an extremely good-looking machine. The doors don’t appear to shut quite as well as they would on the original model (they’re awaiting final fettling), but the car otherwise drives just as a Mulsanne would. Another take on something the manufacturer doesn’t offer. The customer wanted a GT3 RS Targa, which Porsche doesn’t include in its range. The donor car is a 440bhp 911 Targa 4 GTS, so hardly short on performance, and it could simply have been tuned to match the GT3 RS’s 490bhp. However, the customer, and ARES Design, wanted more, so upgraded hybrid turbochargers have been installed along with an enlarged throttle body from a 991.2 Turbo S. With other tweaks to intake and exhaust, the resultant figures are 567bhp and 500lb ft of torque. Added to this are height-adjustable KW coilover suspension units, with ceramic-composite brake discs and six-pot calipers at the front, four-pots at the rear. New Porsche OEM GT3 RS front and rear wings give the GT3 look, but to fill the arches the Targa’s axles have been widened with a mix of GT3 RS, Turbo S and Porsche Motorsport parts. Genuine Porsche front bumper, air ducts, sills and side panels are also used, along with a modified rear bumper made in carbonfibre. The retrimmed interior uses classic Porsche houndstooth material. Each car will take 12 weeks to build and cost between €300,000-400,000. These huge G-class conversions dominate the workspace at ARES Design, towering over the Bentleys and even the hi-rise Defenders. For this reason, ARES Design completely replaces the G-class body with a new version built in carbonfibre and aluminium, which trims 200kg from the original car’s weight. To further enhance performance, ARES takes the 5.5-litre twin-turbo engine and upgrades it from its standard 563bhp to 818bhp and 700lb ft of torque. This is done using hybrid turbos, new pistons and connecting rods, and reworked intake and intercooler, along with an ECU remap. Axle portals are used to raise the ride height, and suspension and brakes are upgraded to KW electronically adjustable coilovers and Movit calipers behind the new 22in wheels. Of course, the interior is new as well, with the rear bench replaced by individual seats and the entire cockpit retrimmed in nappa leather. Prices start at €725,000 and production takes 12 weeks. The plan is to build 14, of which 11 have been built and sold so far. At the time of our visit, this one’s still in build. It’s currently turned on its side to reveal its running gear – a mix of 2014 Porsche 997 and 2017 991, all squeezed into the 1991 Carrera 2 Targa 964 shell, with help from Turbo-style front and rear wings to accommodate wider wheels and the wider track of the modern axles. It will have air-con, PDK transmission, even the latest LED instrumentation, including a huge Panamera display in the centre of the dashboard. The 997 engine (reworked to 4 litres and 464bhp) and PDK are already in place, necessitating a reworking of the chassis rails and an all-new exhaust system. The bodyshell has been acid dipped, repaired and e-coated for longevity. The 997 front axle has had to be cut and chopped to reduce its width, and a new frame added in the floor of the front luggage compartment to support it. As the suspension is the active electronic PASM system from the 997, the entire electric system from the 997 has been used, too. Steering is 997 and brakes are 997 Brembos. The 964 will sell from €300,000, according to specification, with the first available from summer 2018. ARES says it’ll never do big orders – by which it means 100 cars or more. This will be one of its biggest, and production is well underway. It’s a private customer order for 53 near-identical V8 Defenders, built in 007 Spectre style, with hi-rise suspension, all-new interiors and with a choice of supercharged or normally aspirated Rover V8s. Much of the development work around the engines, transmission and running gear has been carried out by JE Motor Works, part of the highly experienced UK-based JE Engineering company that’s one of the most highly regarded of all Land Rover specialists. Similar conversions will take around eight weeks per vehicle at a cost of €200,000-250,000. We like these so much that we’ve devoted a separate feature to them here. This takes us by surprise. Tucked away in the ARES Design photo studio (yes, it’s thought of everything…) is a 1964 Stingray, flawless in high-gloss black paintwork, and sat on original-style Turbine wheels. Except… aren’t those wheels rather large? Yes, you guessed it – this is another project; a Corvette restomod, tapping into the popular US scene of stock-looking classics sat on modern running gear, in this case Corvette C7 with LS3 V8 engine. Bahar rightly acknowledges that the restomod scene is a lucrative one, despite there being no shortage of specialists in the USA. Where it could work for ARES is extending that scene to Europe and to the company’s many contacts in the Middle East. Indeed, this very Corvette is headed to the Gulf, having just been finished. Similar restomods are expected to cost between €350,000-400,000 including the cost of the donor car. Want to know how the Corvette drives? We took this out on a long test – read all about it here. Dany Bahar regularly drives a Model S, but feels that its interior quality doesn’t match that of its more conventional rivals, such as those from BMW and Mercedes, and that the hatchback design limits its practicality. And so… meet the ARES Design Tesla Model S shooting-brake. We find a Model S in one of the workshops, stripped and ready to modify. The roofline will be remodelled and an estate tailgate added, using carbonfibre and aluminium. The interior will be retrimmed to customer specifications by the in-house team; the suggestion is carbonfibre with Nappa leather and/or Alcantara. The shooting-brake will cost €200,000-250,000, and will be available from early summer 2018, with a 12-week turnaround. Around the corner from the design studio, where a team of ten designers – men and women, all dressed in black of course – sit at their laptops, is a smaller area dominated by two large 3D printers, a 3D scanner and the company’s take on the hot trend for customising flat-twin BMW motorcycles. The bikes here have all the required nods to the period café racer, but is based around a new R nineT, with its 1170cc engine, traction control and ABS. The fuel tank is disguised with a carbonfibre cover, the seat replaced with a more traditional-looking item, leather-trimmed in-house, the valve covers swapped for custom-made ARES Design items and the rear converted from monoshock to traditional twin shock. Headlight cowl, rear light, indicators, gear selector, brake pedal, handlebars and even the ’bar switches are also swapped for more retro-styled replacements. Prices for the bike start at €50,000. We head upstairs, via the wide, concrete spiral access ramp, on our way to see Project Panther. But first, a quick detour, to see a Ferrari 365 and a GTC4Lusso – part of the less evocatively named Project Pony. Bahar explains: ‘The customer said to us, “I have 130 Ferraris, and this [the 365] is the most ugly one, but I like it”. We’re going to do a new interpretation of the 2+2. His point is that now we’ve seen the other projects in the metal/carbonfibre, we’ll have more confidence in the 2+2 coming to fruition. And it has to be said, the Project Pony renderings look good. The idea is that it will be a 365 GT4 (or 400/412) with GTC4Lusso underpinnings and updated looks, though actually we’d prefer it if the looks remained unchanged. The cost will be around €700,000, and Bahar says there are already 11 potential orders. Finally, sat in an area that will become a production line, we find Project Panther, ARES Design’s modern-day interpretation of the DeTomaso Pantera. There’s an original Pantera alongside it, notably smaller than the prototype Panther. The basis for the new car is the Lamborghini Huracán, but with all-new carbonfibre bodywork and remodelled interior. It’s expected to sell for €715,000 – Bahar says nine orders have been received already. For the full story on Project Panther, click here. How was ARES Design formed? The customisation was tuning and high-quality carbonfibre bodykits, but soon the company was being asked for more, and ARES Design started to grow. ‘I got some friends and partners of mine – not financiers – along,’ says Bahar. There were seven of them, raising €25 million, and all car enthusiasts. Bahar was born in Istanbul, raised in Switzerland and now lives in Dubai, and he has a formidable list of wealthy associates in the Middle East, as does Bahar’s long-term business partner and ARES Design chairman Waleed Al Ghafari (a property mogul, car collector and movie backer). Several of the investors involved are also having cars built, so they’re effectively helping to fund the company. They then receive a cut of the profits from any further models that are sold. Their investment has enabled the swift growth of ARES Design: the 18,000-square-metre Modena factory, with the lease of a further 10,000-square-metre building over the road to house the prototyping department; a studio/showroom in Dubai; and the latest facilities – fully digitised milling machines, 3D printers and scanners – in the factory. The company is careful to stick to known underpinnings for its creations at the moment, thus avoiding the need for extensive type approval and crash testing. Everything is built to German TÜV standards, widely thought to be the most stringent and universally recognised standards worldwide, with TÜV inspectors paying eight visits per model during development to ensure that the modified cars are reaching the required standards. There are ambitions for more, though, and design chief Mihai Panaitescu makes several references during our visit to wanting a dedicated R&D department, and ‘our own platform, potentially modular’. Both Panaitescu and Bahar talk of electric power for future vehicles. The company has grown quickly, from a team of five to 110 employees in less than five years, and there have been problems with workers adapting to low-volume work after years on production lines, even at Ferrari, Maserati and Lamborghini. The HQ is impressive, but are we being dazzled by the bright-white paint? (Even the wall- and floor-tiling in the washrooms has been painted over in white.) The trim shop is impressive, there’s a carbonfibre autoclave on the way, and there’s no doubting the enthusiasm of the senior team, or their dedication to Bahar; many have worked with him before. Quality feels high, and Bahar clearly understands the market. It makes sense – here is the chance for a successful, wealthy car enthusiast to own or even design a unique or low-volume vehicle, and in some cases take a cut of further sales. (Some prefer to keep their design unique, in which case they pay more). Development time, and hence cost, is kept comparatively low by using computer renderings to create 3D models of new designs. The renderings and the models are sent to the customers when they’re not able to visit, to work through design suggestions and changes. Clay models aren’t used, because they’re expensive and time consuming to create. Aerodynamic performance is computer modelled using CFD (computational fluid dynamics). Bahar acknowledges that there will be cynicism, given not just the Lotus saga but also the history of low-volume manufacturers. He points out several times that our visit isn’t about telling us what the company is going to do, it’s about showing us what it already has done, in order to alleviate at least some of the doubts. He’s robust in answering any criticism, whether real or perceived. For more, visit the ARES Design website.